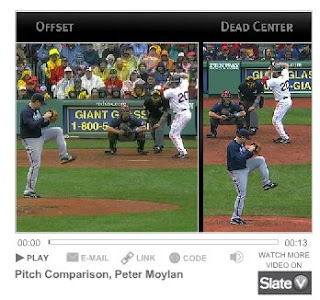 There was an interesting article on baseball TV angles in, of all places, in Slate magazine. Greg Hanlon wrote on July 1st about the oddness of the camera angles most TV stations use for ballgames. The majority of TV camera are behind the pitcher 15 degrees to the left. Therefore viewers at home get a skewed view of the strike zone. However, if the camera was set directly behind the pitched, but elevated a bit, viewers would get to see exactly how the ball breaks, where it crosses the plate—all without trying to guess the skew. For instance, look at the picture below. OK, so if the view is better, why don't more teams use it. Well, one reason is, many stadiums have other things where the camera should be: Luxury boxes, restaurants, bleachers, etc. But there has to be a way around this, no. As Tom Adza, who directs Oakland A's telecasts for Fox Sports Bay Area, says, "In sports TV, we've spent so much money to get better looks at what's happening in a game. But here we show thousands of baseball games on TV every year, and we're not showing the angle that gives the most exact information." dead center view. All of the MLB's other teams, who claim to want the best for their fans, should switch as well. Makes sense to me, seems like it would add another element of valid complaining though. The umpires get it already from fans on tv while being 15 degrees to the side...imagine what they would hear if all stadiums showed the better shot. What I want to know is how accurate is the electronic strike zone box every team and the national coverage use? The electronic strike zone box? Hell, if I put masking tape on my TV, its about as valid as that thing.